The decline of cocaine related treatment demand since 2008 is continuing. In 2015 the number of clients with cocaine use related problems dropped by 10% compared to 2014. 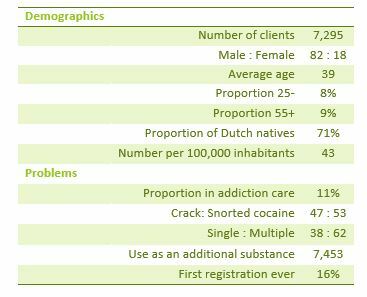 The average age of the clients with cocaine use related problems increased to 39 years. The percentage of young people with a treatment demand for cocaine is declining. Cocaine is the drug that is most common as a secondary problem. After a sharp increase in treatment demand for cocaine related problems between the late nineties and 2008, the past few years have shown a decline. The percentage of people who come for treatment to addiction care for the first time has also declined among the treatment demand for cocaine. Among the group of newcomers, the demand for treatment mainly concerns snorted cocaine.